His farm background includes harvesting crops, milking cows for his grandparents, raising beef cattle and hogs with his parents and showing sheep at the fair. This UW-Platteville junior said it wasn’t until he went to college that he realized not all farm kids have the diverse ag background that he grew up with. That background served him well as he competed and won the 2014 National Collegiate Discussion Meet at the American Farm Bureau Young Farmer & Rancher Leadership Conference in Virginia Beach on February 8. “I was nervous but I was comfortable with my preparation. The more prepared you are the more confident,” said Ethan who competed against 52 other collegiate Farm Bureau members from 36 states. His victory was a culmination of five years of competing in similar competitions. He won the state FFA competition as a Mauston FFA member in 2010 and two years ago he finished in the top four of Wisconsin Farm Bureau’s Young Farmer and Agriculturist Discussion Meet. To qualify for the national competition, he first won the UW-Platteville contest last fall and then the state collegiate competition at the WFBF Annual Meeting in December. Ethan earned a $2,500 scholarship for his efforts, but he raves more about the ideas that came from the discussion and how he hopes it will go beyond just the competition. Both of Ethan’s parents, Ernie and Denise, are Juneau County Farm Bureau members. Since turning 18, he has had his own membership. “I always knew as I got involved in agriculture that Farm Bureau was definitely an organization that resonated with me and that I knew I wanted to be a part of. Farm Bureau does a great job of representing Wisconsin farmers in Madison and Washington, D.C.,” Ethan mentioned. 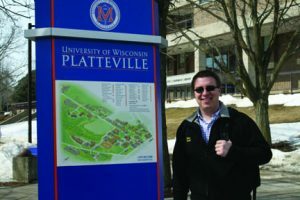 As a UW-Platteville collegiate member, two of his favorite events are Ag Day on Campus and Brag about Ag, where guest speakers talk about ag advocacy. Ethan has sought out several writing avenues to reach his audience. 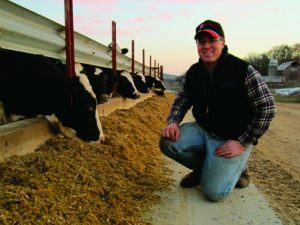 Last summer he worked as an intern for the Wisconsin Agriculturist and continues to do freelance work for the publication. He also writes for Filament Marketing and Hay & Forage Grower magazine. He works part-time in the public relations department of UW-Platteville’s University Information and Communications Office. His leadership in agriculture is tied back to his FFA roots. Serving as his chapter’s president for three years, he said his advisors at Mauston always gave him tools that empowered him to practice his leadership and grow in his character. Ethan served as a state FFA officer from 2010 to 2012 with his final year as state president. He continues to motivate FFA members by traveling the nation facilitating leadership workshops through his work for the National FFA Organization. “One of the biggest things I took away from my FFA experience is the relationships. 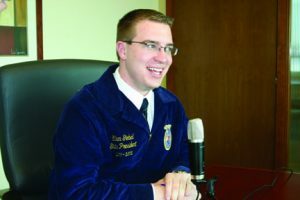 Relationships with my former teammates, FFA members, advisors and other people in the agriculture community,” Ethan said. Compiling his diverse agriculture experiences, from his strong writing and speaking skills, to leading and working with people, there are many who would say this jack of all trades is a master in many of them. 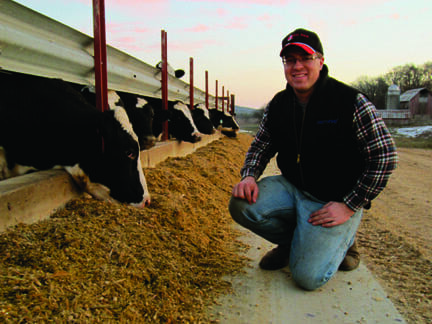 Ethan enjoys working on his parent’s 350-acre farm, EDEM Acres, where they raise Holstein dairy steers along with corn and alfalfa. 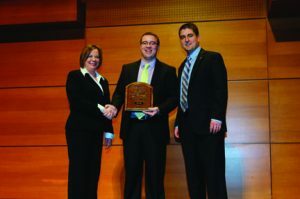 Ethan Giebel served as the Wisconsin State FFA President in 2011-12. Throughout his FFA career, he owned 11 FFA jackets. That’s a lot of corduroy! The collegiate Discussion Meet is an activity designed to help members analyze agricultural issues and decide on solutions that best meet their needs. By participating, members build basic discussion skills, develop a keen understanding of important agricultural issues and explore how groups can pool knowledge to reach consensus and solve problems. It is designed to simulate a committee meeting where discussion and active participation are expected from each committee member. On campus, Giebel is a member of the UW-Platteville Collegiate Farm Bureau, Collegiate FFA and Alpha Zeta. He is also a member of the Juneau County Farm Bureau and a lifetime Mauston FFA Alumni member.